Over the past year and more Terry Spence, former News Director, together with former Chief Film/Tape Editor Geoff Wallace and freelance News Cameraman Daryl Binning, have been on a rescue mission. 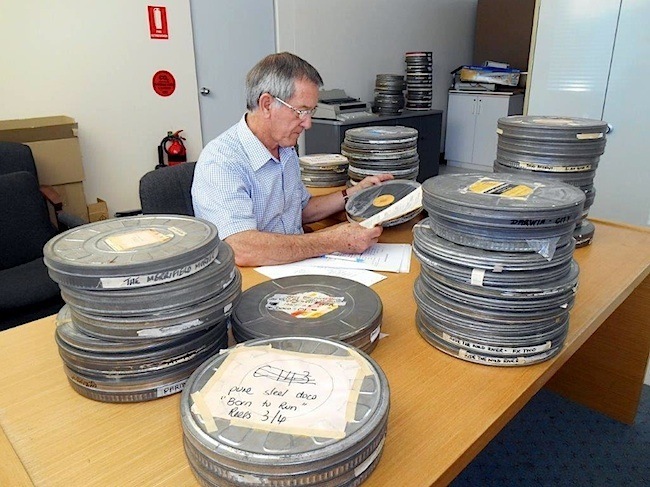 The team has been evaluating what should be preserved from STW Channel 9’s large news film library pending the Perth station’s move from its present location. Terry Spence outlines what was involved. 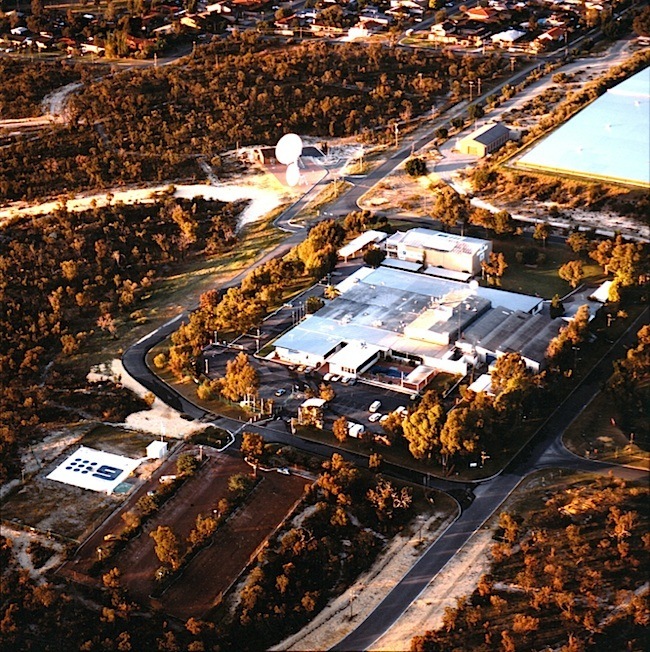 At night, the STW9 complex showing studios, production and administrative areas, helicopter pad with its Channel 9 logo and (top centre) the station’s satellite dishes at the earth station. Channel 9 began broadcasting in June 1965. Soon this complex of buildings will disappear and be replaced by a residential estate. Anyone who has ‘moved house’ after quite some years of living in a residence knows the challenges – one of them being what you take with you; what you toss out after you’ve had your garage sale. It can be a perplexing exercise assessing the intrinsic values of what have been accumulated as personal items. STW9 now has to conduct a similar exercise. After 50 years in the Tuart Hill enclave which has until now accommodated Perth’s three commercial television stations Channel 9 is moving to a swanky new state-of-the-art studio complex located right in the city’s Saint Georges Terrace CBD district. TVW7 has already moved out of Tuart Hill and NEW10 will eventually follow. 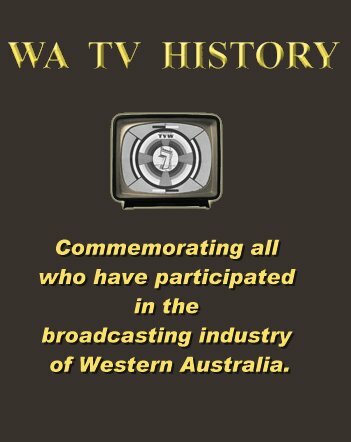 The large area of land from which the thriving business of television once entertained and informed the citizens of Perth for over half a century will become housing estates, populated by communities who now receive their entertainment and information in a variety of electronic forms. But still available for the foreseeable future amongst all that’s now available will be what began it all in 1959: television, first and free. Geoff Wallace at the beginning of the assessment with a stack of film cans, each holding 2,000 feet of 16 mm film and sound tracks. A smaller number of cans holding 400 feet were also assessed. Geoff Wallace calculated that what confronted the team was an approximate total of 285 cans of news and documentary material. Working away with his calculator he figured that at two rolls of 1,000 feet per can that equalled 570,000 feet (in the old money) and that that extrapolated out to 108 miles. Film folk still talk in feet when it comes to measuring film but if the metric standard is preferred that’s 174,000 metres or 174 kilometres. What did all this reduce down to when the team’s work was finished? There are 48 cans remaining holding approximately 36,000 feet or 7 miles of film and sound tracks – hundreds of news stories and 14 documentaries – now stored ready to travel on moving day. 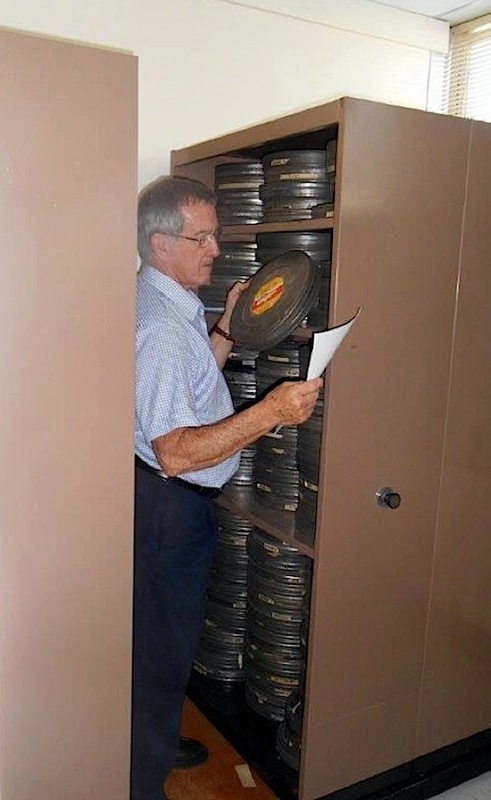 The completed archive is checked by Geoff Wallace. To understand the apparent severity of a culling process reducing so much film down to what now remains to be preserved, the challenges of doing so have to be appreciated. Over its 50 years the station’s newsroom moved a number of times around the complex; the news film library accompanied by a card file system moving with it. Along the way as the revolution of the lightweight electronic video camera began replacing the film camera, the day-to-day process of news gathering and its immediacy saw film as a medium rarely used. By about the early 1980s Channel 9 news gathering was completely electronic. The film library finally became an almost forgotten thing only occasionally called upon for historic footage. Some disarray in its maintenance inevitably evolved. The archiving team found many cans without vital cue sheets enclosed making the identifying of many items impossible. In some cases cue sheets were found in the wrong cans. And most seriously, along the way as the newsroom moved the card file system had disappeared. Selection of material for inclusion in a news film archive is a subjective and imperfect science. What might be judged by one person as being worthwhile may be rejected by another. Nevertheless, at such times choices and hard decisions must ultimately be made by someone. In assessing the Channel 9 news film library the criteria were newsworthiness, historical, heritage, community and sociological considerations. Daryl Binning has a collection of equipment retained from his days in film – equipment not easily found in the all-electronic television stations of today. For part of the assessment process he set up a bench with winders for lacing up film, a viewer and a mini sound sound reader for checking sound-on-film material. Terry Spence watches Daryl at work. What was significant in the rejection of material was the huge amount of major news stories supplied by the international news agency VISNEWS. This had been acquired in kinescope form – relatively poor copies of original stories – in the period before being replaced by either video tapes flown in or later by direct satellite feeds. Any of those kinescoped stories would now be readily available in digital form from whatever agency services the station. Also rejected were many stories from eastern states Nine Network sources, these now being accessible from the network’s archive. Similarly, there was no point keeping film material which over the years had been transferred to an electronic format. All that was being sort was local content on film. The reality of the exercise was that apart from the historical significance of the material there was a space consideration. The space required to store large quantities of bulky film cans stacked in cupboards can be demanding compared with the massive amounts of material that can now be stored in digital format on computer hard drives. 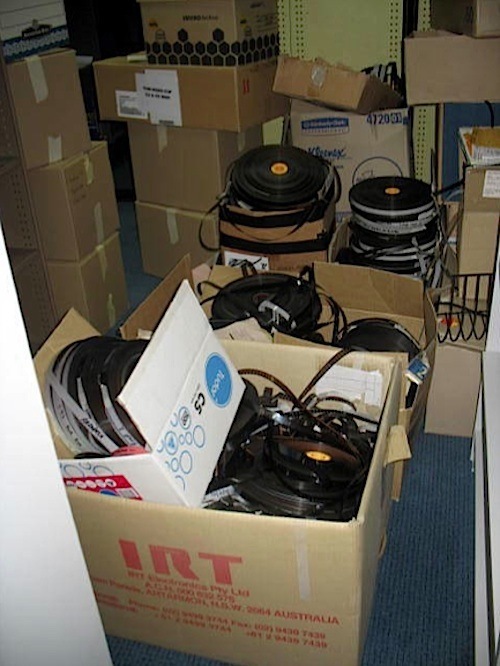 Much of the film piled into these cartons might once have been of only passing interest in Channel 9’s daily news bulletins in the 1960s-70s. Now – the hard decisions having been made – they are been relegated to the dustbin of history. What, technically, is of interest was the use of a particular machine in the assessment project. It’s a machine whose brand name has become synonymous with film editing throughout the world. 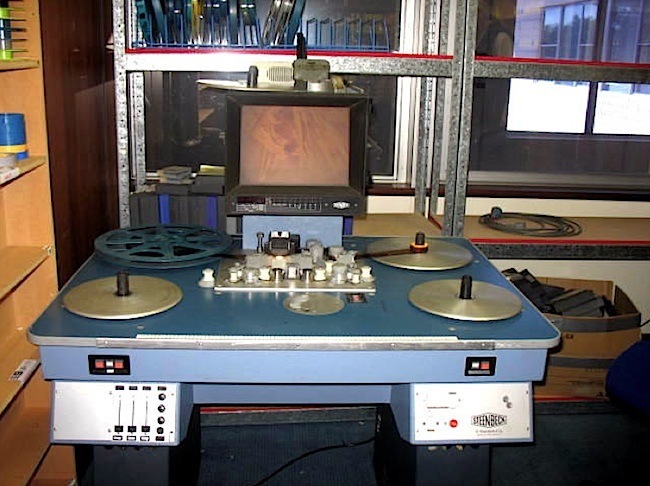 It’s the Steenbeck – a flatbed film editing table which is usable with both 16 mm and 35 mm optical sound and magnetic sound film. 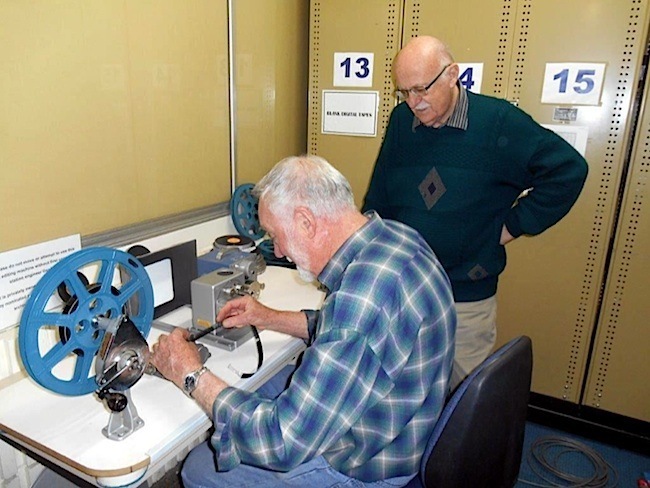 The German-made machine (the company still manufactures them) was the one used almost universally for decades for film editing throughout Australia. However, with the advent of the switch from film to video there are probably only a relative handful of operable Steenbecks now remaining in the country. In Western Australia there are only a few of these left: one, for example, owned by long-time Perth filmmaker Carmelo Musca; the other by Daryl Binning as part of his collection of equipment from the days of film. Channel 9 still has a Steenbeck machine but – rarely used for decades – it is now inoperable. Daryl Binning employed one of the few technicians in WA familiar with Steenbecks to bring his machine back into service. Here, seen located at Channel 9, it was of great help to the archiving team. For about 18 months the team spooled their way through all those miles of news stories, clips of film from daily news bulletins, some as short as 20 seconds. It was a viewing of a cavalcade of people, public figures and politicians; of events historical, haunting and humorous. They were the stories which ‘made the news of the day’, images from about 15 years of the state’s history. Those judged worthy of historical interest will be carefully preserved; those of ephemeral or short-lived interest have been surrendered to a time now gone. 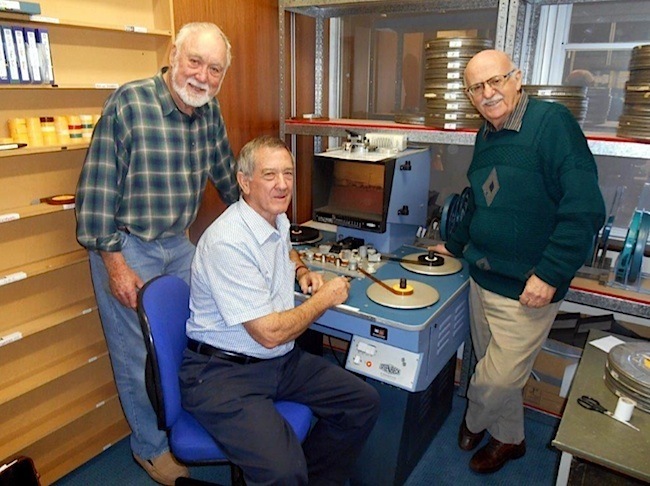 Geoff Wallace (seated) at the Steenbeck with Daryl Binning (left) and Terry Spence. Geoff in his long career as a film editor at Channel 9 would have edited thousands of news stories on a similar machine. Sounds like the guys have done a stirling job with 9s film – but I’m a bit concerned that they seem to be using metal cans (from the photos in the article). Unfortunately if this is the case it will lead to far faster deterioration of the film than plastic cans. I also wonder if they have stored the sound and image reels separately? If they are stored together any sound reels that have been affected with vinegar syndrome will then infect the image reels they are stored with. FYI the ABC in Perth also has a working Steenbek and a spare for parts. Hi Geoff, Terry & Daryl. Good to see this. Sad to hear of the old station’s demise. I remember odd bits, like the Sunday “Spency” brought in pizza…& the morning I used my Cortina to jump-start the helicopter. and some names…like Errol Considine, Mike Haanapel, Caroline Van Der Gaag. Other names I can’t recall…Terry’s secretary (she also did the autocue), the film editor with the dark beard….& what’s-his-name at the “hamburger stand”. film editors: Tania Allard, Alan Cox, Mike Haanappel, Gillian Walker …. studio directors: Russ Cuneen & Ian Jobsz, …. news cameramen: Paul “Noddy” Langoulant, Pedro Santafe, Simon Wearne, Neil “Trudge” Trudgeon, Fons Berkhout, Simon Akkerman…. also recall: Steve Nikola, Mike Odea, Bob Willoughby, Vic Longbon. For what it is worth, I also have an operable Steenbeck that I recently obtained a new timing belt set for. The belts are of a unique 6mm tooth pitch which has become obsolete or very, very uncommon. If you are chasing parts for Steenbeck ST1600 or near vintage, an outfit in the US, findable at http://www.cutfilm.com can supply them plus updated plug-in modules. The proprietor is a Steenbeck specialist. Purchased long ago when Networks, turned to “betacam”& did it on the cheap. My late father told me he was on a music show called “Pad 9″, on Channel 9 in Perth. His name was Ross Bradshaw and he was a guitarist with the band, The Dymensions. The Dymensions became the show’s house band for a short while and were popular amongst the “Stomps” of the mid 1960’s. 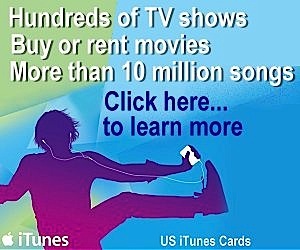 Have you heard of the TV show, “Pad 9″, and if so, do any remaining episodes exist? I am making an enquire on behalf of a colleague re an interview which was conducted by Tony Monaghan (about 1995 ) on the subject of child abduction. In this report Tony made reference to a child by the name of Samuel Corin and his father Brian Corin.